T-Mobile has long encouraged customers to bring their own device to its network, and today it continued that effort with the release of a new Android app. The BYOD Check App is now available on for Android and iOS. With it, you can determine if your phone is compatible with T-Mobile’s Extended Range LTE coverage and its Voice over LTE service. To perform the check, you can use your phone’s camera to scan for its IMEI or you can enter the IMEI manually. The app will then do its work and if your phone is compatible, you’ll get an “All good!” message with an image of a happy little phone. It can be tough to determine if a phone supports T-Mobile’s Extended Range LTE and VoLTE, especially if you’re not super knowledgable about smartphones and cellular networks. 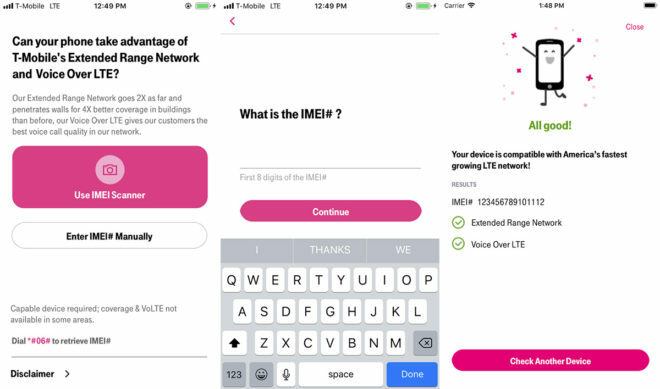 That’s why it’s good to see T-Mobile release this BYOD Check App, especially since Extended Range LTE and VoLTE are both important features of T-Mo’s network that the company regularly touts. This is pretty awesome! I wish they had a app to check if the phone is not reported stolen or black listed.. Ya even more important because people can have a phone in good standing but still being paid, tell you it is paid off, sell it to you, THEN stop paying for it getting it blacklisted after you bought it with it initially seeming to be OK. Both you and Pak T have convinced me to stay away from used phones. Unless there is a sure way to buy and not get burned. Swappa is very stringent. I’ve bought and sold there with zero issues. They verify if stolen and if a device has a balance before allowing a phone to be listed for sale. Okay, I will check out swapa. Unfortunately on iOS it keeps freezing, not just for me but for two others who reported it on the comment section of the app in the App Store! The weird thing about this one is to me, probably because I don’t understand how it all works, rather than entering the IMEI and doing a look up, wouldn’t it be more effective for the application to simply try out those features directly on the phone? At any rate, a nice tool all the same. I just checked my mom’s Verizon s8 plus and it said it was compatible with both volte and extended range LTE. But it ain’t true I put my T-Mobile SIM before many times . And I do get LTE but its never BAND 12 always band 4 . AND every time I make a call it drops down to “H+” and once I hang up LTE comes back up and again BAND 4 . No BAND 12. Verizon does have nationwide volte , and since it has more LTE than T-Mobile it works everywhere . With her verizon SIM card volte works fine . Its just when i put a tmobile sim or a friends att sim it doesnt work . They probably disabled it on Verizon phone’s because with the Verizon SIM card it works fine . That is why I don’t trust carrier bought phones anymore. Unlocked all the way. Love my new Google Pixel 2 XL. My old Pixel XL I used on Verizon I gave to my gf. Popped her T-Mobile sim in, works perfect with VoLTE, HD Voice, and Band 2/4/12. Her S8 might be capable of the T-Mobile bands, but they are possible disabled on the phone since Verizon has it “locked down” software-wise. What funny is that when we bought it at the Verizon store I was thinking it’s gonna have Verizon brandings everywhere. But nothing no Verizon branding at all . Only branding it has is the Samsung one. And it was unlocked . Came in handy in our last mexico trip she just popped in a Mexican SIM and didn’t have to set up the APN settings it did everything in it’s own with the telcel mexico SIM and at&t mexico SIM and got LTE on both . I have T-Mobile so I don’t need to buy a Mexican SIM. Since T-Mobile is really free in Mexico. But again I noticed on hers with the Mexican Sims and the my T-Mobile SIM she gets LTE but no VOLTE even tho at&t mexico also has volte nothing….everytime she made a call it drops down to “H” So I guess your right Verizon probably disabled it even tho it does support the LTE Bands I guess they disable volte . Because like I said only way she gets volte on that phone is with her original Verizon SIM. So I don’t know why this app said it supports volte when I checked it haha. Lol you really need an app for this? Not everyone is as…adept…as us to do the research… Normies will find this app useful. How do I use the camera to scan my IMEI? it’s located under the battery, LOL. Said my Nexus 5X is supported. Yep! I believe the G4 was the last LG phone to not have B12. G5/V10 and up have it, I believe! The Verizon note 5 does not support band 12 on T Mobile. LG’s G2 and G3 didn’t support Band 12, but the G4 did, which is why I upgraded from my G2. The fact that the battery was running out also helped me make that decision. The 8/10 iFixit repairability score for the G4 didn’t hurt either. Sounds good. This will really help when I get my next phone, as T-mobile doesn’t carry Sony phones anymore, nor Blackberry as far as I’ve seen.